As we watch the daily barrage of accusations and innuendo directed against President Trump by the far left, the liberal media, and even some in his own party, those of us who voted to put him in the Oval Office need to remember one crucial point: President Trump is not the real target. You are. 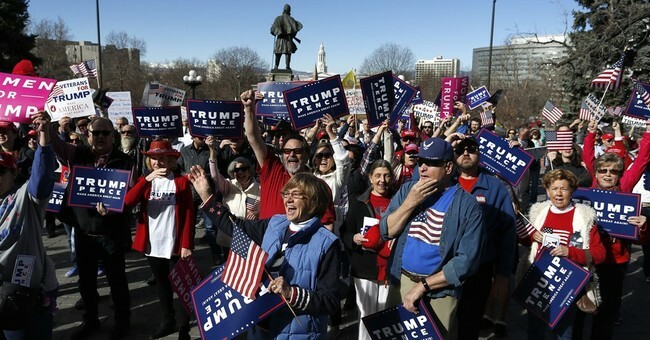 Even considering his outsized persona and the stunning phenomenon of an outsider who has never held political office winning the presidency against one of the most powerful political machines in American history, the new movement that elected Donald Trump has never been about Trump. In the 2016 election, the “forgotten men and women of America” were hell-bent to send a message to the powerful elites of both parties. The message was that the Washington elites are serving themselves and their own agenda and ignoring the rest of the nation. The message was that Washington has become a swamp of corruption and self-serving collusion among powerful interests and that Main Street America is ready to see that swamp drained. Donald Trump was our messenger. Because his candidacy was not about Trump the man but Trump the messenger, he was able to withstand the smears and assaults of the Clinton Machine that would have sunk any other candidate. They siphoned all the way to the bottom of their slime barrel, and still the message prevailed. That message was simple and grounded in common sense. No country can survive unless it has control over its borders. People coming into American should be vetted to make sure that they pose no danger to us. After eight years of stifling taxes and regulations, we should once again make America a healthy place in which to do business, make products, and create jobs. Political correctness may seem silly and laughable, but in reality it poses a serious threat to free expression and open exchange of ideas. If it’s terrorism, call it that. Say what is obvious to our common sense even if it offends the delicate sensibilities of the elite. The leftists who worked to radically transform the nation under Barack Obama are telling us that they hold the reins of power and that we the people don’t run anything. They are telling us that their agenda will prevail regardless of how we vote or what we want. They are telling us that they can subvert, attack, and destroy any messenger that we send into their territory. And feckless leaders in the GOP seem, at best, more afraid of displeasing the Democrats than betraying their own voters, and, at worst, in cozy collusion with the opposition. What is at stake in the barrage of innuendo, twisted news, and “investigations” is not just the future of the Trump presidency, but the future of the very idea that governmental power rests ultimately on the consent of the governed. Of course there is much at stake in the actual policy questions facing the country. But underneath the debates about border security, court appointees, tax and regulatory policy, and so on lies a deeper question that is at the very heart of our system of government: Can the American people still change the direction of the country if we believe that the country is headed in the wrong direction? Or will the powerful and self-serving elites impose their agenda even when we don’t consent to it? When the voters put leftists in power, as they did with the election of Barack Obama in 2008, the country moves left. But when voters try to change course, as we did in the elections of 2010 and 2014, the country still careened towards open borders, government control of healthcare, rule by rogue judges, and lawless license for those in the power elite. And so we went outside the traditional path and elected Donald Trump in 2016. The liberal news anchors had barely dried their tears after Election Day when the left began to cloud the real meaning of Trump’s election by pushing the bizarre claim that the Russians had somehow hacked the election. In their gaslighting version of reality, you didn’t really vote to drain the swamp. You didn’t really vote to secure our borders. You didn’t vote to repeal and replace Obamacare and put doctors and patients back in charge instead of Washington bureaucrats. You didn’t vote to restore rule of law and common sense to Washington. The Russians somehow threw the election to Trump. You can go back home now and let the experts run things. It’s swamp gas. Don’t breathe it. There is plenty in Washington that merits investigation, from foreign influence through the Clinton Foundation to Obama’s use of intelligence data for political purposes. Congress has the power to do just that, but we need to give them the will. Let’s remind our representatives that they might forget us, but we won’t forget them. Tim Daughtry is a conservative speaker and co-author of Waking the Sleeping Giant: How Mainstream Americans Can Beat Liberals at Their Own Game. Follow him on Twitter @TCDwriter.